Wellington Road: Clean, green New Zealand. Yeah, right. I am posting every day for the month of August for Nablopomo (National Blog Posting...). There is a theme for the month, which I mostly will be ignoring. The theme is (drum roll) GREEN. New Zealand being clean and green is accidental, not deliberate. New Zealand's clean, green image is a result of its remote location and late settlement by humans. Because of its isolation and small population, New Zealand is at a disadvantage compared to some other countries. It has marketed itself as clean and green to command premium prices for exports, and also to encourage tourists to travel long, expensive distances to visit its forests, lakes and rivers, coastline, and wildlife. New Zealand's exports make up 90% of its GDP. It also is dependent on its landscape-driven tourism industry. While New Zealand is a beautiful place to visit, it is an ecological disaster. Since the Europeans arrived in New Zealand, over two-thirds of the native forest has been cleared. Its soil and waterways have been polluted by intensive farming and pesticides. The Manawatu river is the one of the world's dirtiest rivers. Deep-water oil drilling without a failsafe is occurring off the shores of New Zealand. Governments have ignored environmental initiatives related to air pollution and industrial emissions. Although New Zealand made some admirable stands, such as banning nuclear warheads from its shores, its high CO2 emissions are among the worst in the OECD. Overseas, New Zealand is perceived as a country with clean air, but the air quality in cities like Christchurch in the winter is shocking. Coal is mined and burned (along with natural gas) for about 30 percent of our household electricity needs. (There are some other commerical and industrial uses.) New Zealand also has one of the world’s highest rates of car ownership. Greenhouse gas emissions are high, as New Zealand has more cows than people. New Zealand’s household waste and energy consumption also are high compared to other developed countries. New Zealand’s oceans are being emptied, and there are no sustainable fisheries. Many native species of birds and other fauna are on the verge of extinction. None of the animals or crops and few of the trees harvested are native to New Zealand. Pests like possums and rabbits pose a threat to New Zealand’s economic welfare. Corporations are pressuring farmers to move away from free-range, grass-fed cows to indoor factory farming. And corporations are trying to bully New Zealand into accepting genetically modified (GM) crops, which are a threat to the country's biosecurity. 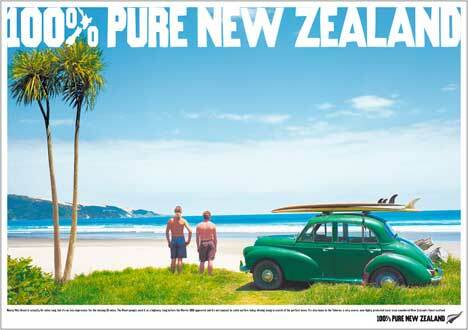 The marketing strategies of "clean, green" and “100% Pure New Zealand” are politically and commercially driven. 100 percent is a bold statement, which eco-tourists and consumers interpret differently than they did 10 years ago. Unfortunately, New Zealand’s “clean green” image is just not the reality. Good to get the skinny from one who knows and lives there. This was a really interesting post, thank you. Okay, I won't disagree that NZ needs to work on environmental issues, but you do have quite a few errors in your post. For example, I am pretty sure that NZ only has one power station that still uses coal (Huntly). The rest are hydroelectric or geothermal. Also, Maori agriculture was one of extensive land clearance, having cleared 30 something % of forest before Europeans ever even got here. So, umm, you might want to check your facts (or get them from verified sources) next time. Dear Anonymous commenter, you are correct. I was lazy in writing this post and not citing my sources. And some of the facts that I have gathered could be wrong. As anonymous says, your overall argument is true, that our clean, green image is more down to being small and far away. However, there are several incorrect facts here. Our electricity is 70% non-fossil fuel, mostly hydro, and geothermal and wind power are growing rapidly. We have one of the cleanest electricity systems in the world. Yes, we still use some coal, but compare us to both the US and Germany - they produce 70% of their electricty from fossil fuels. The Manawatu river is not the one of the world's dirtiest rivers. It was the worst of the 300 rivers, mostly in rich nations, that were tested by a particular research group using a particular technique. (Press release from the researchers who did the original research) It's certainly not good, and should be fixed, but the research only looked at a tiny fraction of the rivers in the world. The Hoki fishery has been certified as sustainable by the Marine Stweardship Council. MSC are also looking at whether the Hake Trawl, Ling Trawl and Longline, Southern Blue Whiting Trawl, Albacore Tuna Troll and the Southern Scallop Dredge fisheries can be certified. Confirming that a fishery is sustainable takes a fair bit of research, but if our fisheries are successful in their application, then NZ will be responsible for 6 out of the 90 or so sustainable fisheries in the world. NZ needs to do better, as does every nation in the world, and we need to convince everyone of this. Getting the facts wrong just weakens our argument. This was really interesting. I wasn't even aware of the green push in marketing New Zealand. Now I'm better informed. I guess we all have a long way to go in helping to make this planet safe and healthy. Jez, thanks for your comment. It's true that NZ does very well for a small country. I should have pointed this out in my post. However, I'm not sure that I agree with you about my "facts" weakening the case for a cleaner, greener NZ. As you point out yourself, at least 30% of our household energy comes from gas and coal, and the Manawatu river is one of the world's dirtiest rivers. I am not convinced that the hoki fishery actually is sustainable. Who is ensuring that quotas are not being ignored by other countries (like Japan) with deep trawlers in our waters. Nobody. Wow. That's a lot of info I wasn't aware of. Thanks. Too many people will read the "article" and not enough will read the comments where your blatant mistakes are corrected. If you're able to, I strongly suggest that you take down your post, and actually properly research your "facts" before posting up a bunch of lies and conjecture. I don't think you made any 'blatant' mistakes..
"Coal is mined and burned (along with natural gas) for about 30 percent of our household electricity needs..."
That is entirely true according to this source..
"Non-renewable fuel types (coal and gas) are accounted for as they are used in New Zealand’s six thermal electricity generators." And then has a graph showing that coal plus gas adds up to 31% of our electrictity generation (not to mention the petrol and gas burnt in our cars, trucks, trains and ships). It's basically true that NZ's clean green thing is mostly a happy accident of history and not a sign that we made the right choices in the past for green reasons. Going forward, I think we have a stronger 'green' element politically and culturally than many other places (except some places in Europe). Certainly much more so than the United States. But we can do, much, much better. Check out cleangreennewzealand.info for some similar articles.